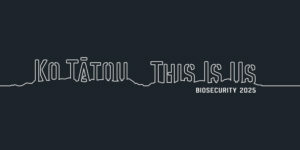 Ko Tātou This Is Us asks us to take a moment to think about how biosecurity protects our way of life, the outdoor environment where we fish, farm,hunt and explore, the beautiful biodiversity of our unique ecosystem and even the food we eat. Every New Zealander has a role to play in preventing pests and diseases from getting into New Zealand or helping to stop their spread if they do get here. The movement shows all New Zealanders, both individuals and businesses, that they are essential in helping strengthen our biosecurity system and every small action towards better biosecurity is important.